New England Buried Again; Snow Now On Ground In 49 States : The Two-Way Every state except Florida has at least some snow on the ground, according to the National Weather Service. In Massachusetts, thousands are without power because of the latest blizzard. Roy Williams of Westfield, Mass., shovels snow in front of his vehicle on a merge ramp on Interstate 91 southbound in Windsor, Conn., Wednesday, Jan. 12, 2011. Thousands of people in New England are without power as another blizzard hammers the region. Some places up there, as the Boston Globe writes, can expect to get about two feet of the white stuff before the storm moves on later today. According to our colleagues at WBUR in Boston, "wetter, heavier snow than anticipated has knocked out power to tens of thousands of Massachusetts residents. ... As of 9:30 a.m. [ET], more than 87,000 homes were without power, mostly in southeastern Massachusetts." 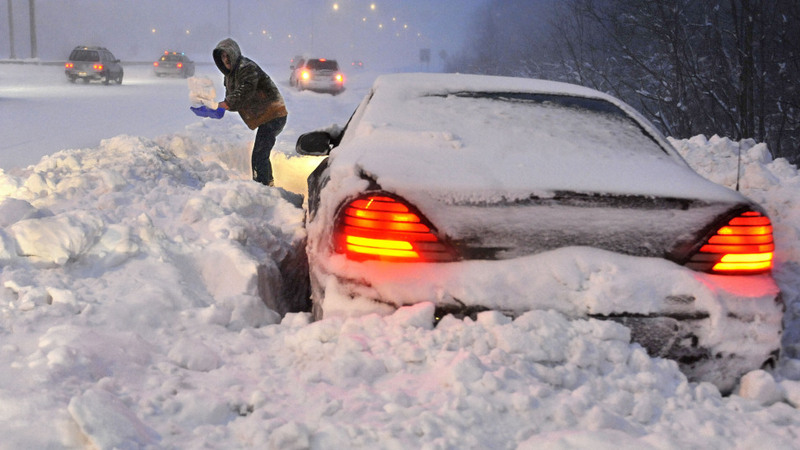 It's the same storm that "shut down much of the South" yesterday, the Associated Press notes. You might recall that last February, we posted about the news that there was at least a trace of snow on the ground in all 50 states. Well, according to the National Weather Service, the only state that this morning didn't have at least a bit of snow on the ground was Florida. Yes, according to the Weather Service: "This includes Hawaii where about seven inches of snow is atop Mauna Kea." 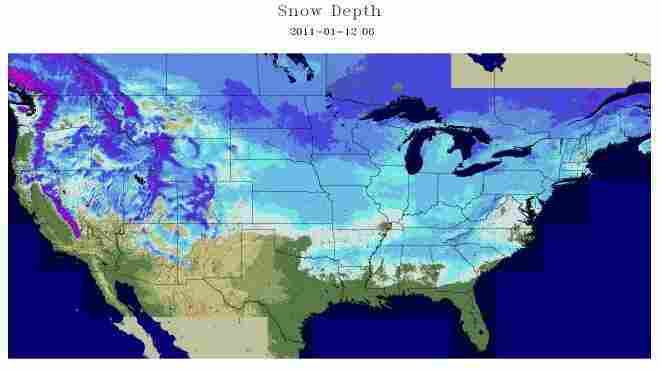 The snow cover across the "lower 48" as of this morning (Jan. 12, 2011).